Save-the-Date Flyer for Oct. 6, 2016 Walk-Ins: Use this flyer to spread the word about the next round of national walk-ins on October 6, 2016. Media Toolkit for Oct. 6 Walk-Ins: Everything you'll need to do press and media outreach for your local event! One Pager: Brief description of the nationwide walk-in action planned for Oct 6, 2016. Visibility Materials: Feel free to download and use these two poster designs and this shareable social media graphic! Please be aware that some national and local unions are working to print and deliver these posters to you, so you may want to check with your union contact first. 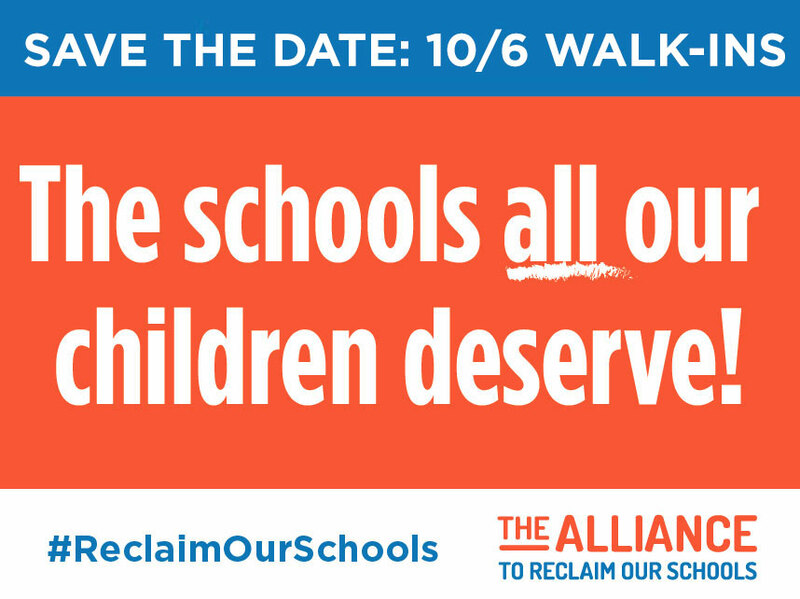 Social Media Instructions for All Walk-In Sites: [Word Doc] [PDF] The main hashtag for Oct 6 is #ReclaimOurSchools. Here are some sample tweets and resources to use on social media. Walk-Ins in Real Life: What does a walk-in actually look like? Check out a few of these short videos from past walk-in events to find out! Planning Template: Getting ready for a walk-in? This template will help you think through your goals and steps towards building a successful walk-in. It can be used for a whole district, or a single school. Adjust accordingly! Organizing Timeline: As your walk-in planning gets underway, here’s a sample timeline of activities to get you on the road to a strong walk-in. Sign-up template: Here is a sample template you can use to create a sign-up sheet or commitment cards for community folks, organizational members or teachers asking them to commit to joining a walk-in. Put ‘em to work! Here is a list of ways that you can put volunteers to work before and during the walk-ins! These are all critical tasks that someone should be in charge of. Sample Day-Of Agenda and Program: The details of your walk-in will depend on the local context, but here is a sample schedule for the day, starting when you gather at the site and ending when you send students and teachers into the school. Sample Announcement Flyer: Create a flyer to announce your walk-in! Here is an example of a flyer announcing the walk-in. As you make your own, feel free to use anything you want from this sample. Sample "Why We Are Here on Oct 6" Flyer: Here is a sample day-of flyer to distribute during the Oct 6 walk-ins. Feel free to use and modify this template. Site Coordinator Form: Sample form you can use to collect information from each of your school sites on the day of the walk-ins to document participation, event highlights, and media hits. Parent Involvement Guide: Here are some helpful tips from the Alliance for Quality Education and UFT for reaching out to parents at your school and encouraging them to join the walk-ins on Oct 6 (and future actions!). Action Network Instructions: The Oct 6 walk-ins are taking place in cities across the country. Help us show how big this movement is by dropping a pin for your city on our Action Network event map. Follow these instructions to add your local event as a pin. Using ESSA To Demand Sustainable Community Schools: The newly passed Every Student Succeeds Act (ESSA) reauthorizes the federal Elementary and Secondary Education Act. This new law opens up opportunities for us to demand sustainable community schools in our cities and states, to reduce the impact of high-stakes assessments, and to redefine which schools need additional support to serve our students. Here are two analyses of ESSA, one from AROS and one from our friends at FairTest. Useful resources: There is a lot of research you can cite and share over the course of the walk-ins. Here are a few great reports and other resources from organizations in our network. "Community Schools: Transforming Struggling Schools into Thriving Schools" by The Center for Popular Democracy, Coalition for Community Schools and Southern Education Foundation. Infographic: "The Facts About State Takeovers of Public Schools"